Taylor Swift soaks in her top entertainer win with her band at the CMAs. Taylor Swift made history at the 43rd Annual Country Music Awards, becoming the youngest person and first solo act ever to walk away with the CMA’s coveted entertainer of the year prize. The 19-year-old pop sensation won awards in each category she was nominated, which also included best album, female vocalist and music video of the year. The teen pop star ended Kenny Chesney’s hold on the top entertainer category for the last three years. She also beat ex-American Idol Carrie Underwood as best female vocalist, putting a stop to Underwood's three-year string of victories. After winning for best entertainer, Swift kissed Chesney on the cheek then aked her band to join her on stage. As the group of musicians hugged her, Swifts's father was cried in the audience, the AP reported. Swift's big night at the Oscars of country music came one day after the "Love Story" singer won top song honors at the BMIs, another industry awards show. 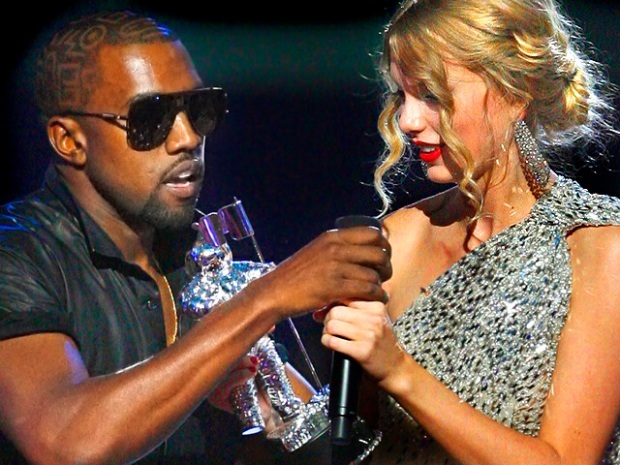 It’s also been nearly two months since rapper Kanye West interrupted Swift’s best female video acceptance speech at MTV’s Video Music Awards, a move that has propelled Swift’s public profile to new heights and tarnished West’s image. During the CMAs, co-hosts Brad Paisley and Carrie Underwood referenced the Kanye debacle during an opening song they performed. “Mama don’t let your babies grow up to be Kanye,” they sang. The pair also brought up West again while discussing the break up of Brooks & Dunn. Swift wasn't the sole artist to make history at the CMAs. Former “Hootie and the Blowfish” frontman Darius Rucker became the second African-American to earn a major award from the Country Music Association with his best new artist win, according to the AP.